Jonathan Boulton has a double Major in Zoology and Geography and has been involved in eco-tourism and conservation management in South Africa and Botswana for some years. After working as the Estate Manager at Walkersons Country manor and Millstream in Dullstroom, Mpumalanga, he started his own fly-fishing consultancy, Mavungana Flyfishing Consultants South Africa, based at the Mavungana Flyfishing Center. He has completed fishery management and river rehabilitation courses in Europe. He has traveled and fished the United States extensively, spending time with the State Game and Fisheries Departments of Utah and Montana. In 2000 he represented South Africa in the Commonwealth Flyfishing Championships. His company is currently involved in the development, management and marketing of over a dozen well-known trout farms in our region. 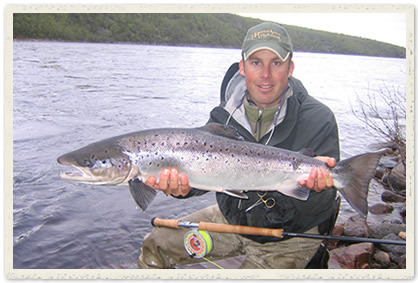 As well as guiding local and overseas fly fishers to top destinations on the subcontinent, Jonathan writes for both our national flyfishing magazines and owns a very successful flyfishing retail business. He is a qualified REFFIS instructor, and the only internationally certified full time flyfishing instructor in South Africa. Jonathan has trained up three young guides, John Thoebala, Selby Zulu and Collen Shabangu, they currently take out both overseas and local clientele, and number amongst the countries most accomplished and experienced fly fishermen. For help with any inquiries you might have regarding fly fishing opportunities and fly fishing business development you will find his contact details and website address opposite.